I got a request from one of my nice Twitter followers to tweet one basic phrase everyday like I do for Super Basic Words. I assume all my twitter students have different levels and interests. But after consulting them, I decided to aim the lower levels and I’ve startedto tweet two basic phrases per day (one basic phrase and one related phrase which could be more difficult than the first one.) since August. This was an experiment but guess what! After all, in the end we have learned 144 phrases in total. がんばったね！(= Ganbattane!) You did very well! Now it is time for you to review. I made sound files for all the phrases. There are 2 phrases in each sound file. I read each one twice: once slowly and once at natural speed. To be honest, it was a lot of work for me to record all of them, but I think it is very important for you to acquire the natural intonation. These are all basic phrases. I avoid overly polite or casual expressions. But I added the remarks “casual” or “polite” when necessary. And they are all neutral so that both men and women can use them. They are all random so you can start learning any phrase you want. Before we start, let’s look at the picture above and study the quotes. = Please try to give me one compliment everyday. *私のこと= Watashi no koto = We often add こと(=koto) after pronoun. = Dochira kara irasshaimashita ka? = Goshusshin wa dochira desu ka? = Where are you originally from? = I am sorry for the other day. = Chotto ii desu ka? = Do you have a minute? = Sukoshi ojikan wo itadakemasu ka? = I can’t do it./ It’s impossible. = Don’t feel obligated. /Don’t push yourself. = Mainichi atsui hi ga tsuduite imasu ne. = Take care! Get well! = Douzo kureguremo odaiji ni nasatte kudasai. = Please give me a rain check. = I will give you a rain check. = Nice to meet you! = Hajimemashite douzo yoroshiku onegai shimasu. = I’m sorry for not replying earlier. = Itsu ga ii desu ka? = When is convenient for you? = Itsu ga gotsugou ga yoroshii de shouka? = Please go ahead! / After you! = Osaki ni shitsurei shimasu. = (Direct translation) Excuse me for going/leaving before you. = Have a nice day/Have a nice trip. = Doko ni sunde imasuka? = Where do you live? = Osumai wa dochira desu ka? = May I ask where you live? =Toire wa doko desu ka? = Where is the restroom? = Otearai wa dochira de shouka? = May I ask where the restroom is? = Shichaku shite mo ii desu ka? = Can I try this on? = Shichakushitsu wa dochira desu ka? = Where is the fitting room? = Goshinpai wo okake shimashita. = I’m so sorry that I made you worry. = Please don’t go to any trouble. = I’ll take this one. = Donna eiga ga suki? =What kind of movies do you like? = Issho ni eiga ni ikanai? = Do you want to go see a movie with me? = Ima nani wo shiteiru no? = What are you doing now? = Konshuumatsu nani ka yotei aru? = Do you have any plans this weekend? = Shashin wo totte mo ii desu ka? = Can I take a (your) picture? = Shashin wo totte itadakemasu ka? = Could you take my(our) picture? = Take a good rest. = Nanji made aite imasuka? = How late do you (does it) open? = What are you interested in? / What do you do in your spare time? = We have the same taste. = Where should we meet? = Doko de machiawase shimasyouka? = Onamae wo oshiete itadakemasu ka? = May I have your name, please. = Inu wo katte imasu ka? = Do you have a dog? = Nanika petto wo katte imasu ka? = Do you have any pets? = Kyou wa oyasumi desu. = It’s my day off today. = Kyou wa oshigoto oyasumi desuka? = Is it your day off from work today? = Nyuuyooku ni itta koto ga arimasu ka? = Have you ever been to N.Y.? = Nihon ni kita koto ga arimasu ka? = Have you ever visited Japan? = Karaoke wa suki desu ka? = Do you like Karaoke? = Karaoke wa nigate desu. = I am not good at Karaoke. = Donogurai nihongo wo benkyou shite imasu ka? = How long have you been studying Japanese? = Mada hajimeta bakari desu. = Do I look good in this? = Aka ga niaimasu ne. = You look good in red. = I’m sorry. I don’t understand ~. = Sumimasen. Mou ikkai yukkuri itte kudasai. = I’m sorry. Could you repeat it again more slowly? = Koko wa doko desuka? = Kono mise wa doko ni arimasuka? = Where is this store? = Kono hen ni Internet cafe wa arimasuka? = Is there any Internet cafe around here? = Is it free of charge? = Do I have to pay?/ Do you charge for this? = How much is it? = Zenbu de oikura desuka? =How much is it all together? = Let me think about it. = Count me in., Let me join you. = Nakama ni irete moratte ii desu ka? =Do you mind if I join you? / May I join you? = Nani ga oishii desuka? = Nani ga osusume desu ka? = What do you recommend? = Can you help me? = Chotto te wo kashite kureru? = Can you give me a hand? = How old are you?/ How old is she/he? = How old are you? / How old is she/he? = It’s not a big deal. = Zenzen taishita koto arimasen. = It’s not a big deal at all. = I am sorry to hear that./ That’s too bad. = I’m relieved. I feel happy. = I am happy for you./ am relieved to hear that. I am happy for you. = Kyoudai wa imasu ka? = Do you have any brothers or sisters? = How many brothers and sisters do you have? = Say hello to Maggie. = Maggie Sensei ni yoroshiku otsutae kudasai. = With pleasure! . I’d love to. = With pleasure! / I’d love to./ By all means! = Pen wo kashite kuremasu ka? = May I borrow your pen? = Otearai wo okari shite mo ii desu ka? = May I use your bathroom? = Eki kara tooi desu ka? = Is it far from the station? = Donogurai(kurai) jikan ga kakarimasu ka? = How long does it take? = Kippu uriba wa doko desu ka? = Where can I buy a ticket? = I lost my ticket. = Keitai no meruado oshiete kureru? = Can I have your cellphone’s email address? = Do you want to exchange our email addresses? = Denwa bangou wo oshiete kuremasu ka? = May I have your phone number? = Ketai no denwabangou wo oshiete itadakemasu ka? = May I have your cell phone number, please? = Tabako wo sutte mo ii desuka? = Shinjuku made onegai shimasu. = Can you take me to Shinjuku please. = Koko de tomete kudasai. = Kono seki aite imasuka? = Is this seat taken? = We are full at the moment. = May I order (now)? = Please take an order. = Chuumon wo kaete mo ii desu ka? = May I change my order? =Dokode nihongo wo benkyou shimashitaka? = Where did you study Japanese? = I studied (I’m studying) on my own. = Nihongo ga jouzu desune. = Your Japanese is good. = How many languages do you speak? = What’s wrong? / What’s the matter? = Are you all right? = Tabete mo ii desu ka? = Kore wa douyatte taberu no desu ka? = How do you eat this? = Did you sleep well? = I am looking forward to it. = Kinou wa totemo tanoshikatta desu. = I had a good time yesterday. = Thank you for your help. = Kyou wa nannichi desu ka? = Kyou wa nanyoubi desu ka? = What’s today?/ What day is today? = Mainichi hitokoto watashi ni ai wo sasayaite mo ii desu. = Or you can also whisper a word of love for me everyday. Thank you for another awesome lesson! = Issho ni shashin wo totte mo ii desuka? = Issho ni shashin wo totte mo ii? Hi sensei! I really like your lessons, they’re really helpful. Why did they use の instead of が? Is it because it’s a short form of 苦いの者が嫌い or 苦いの食べ物が嫌い? Glad to hear you like my lessons. Now instead of saying 食べ物, you can just say の (things) in conversation. 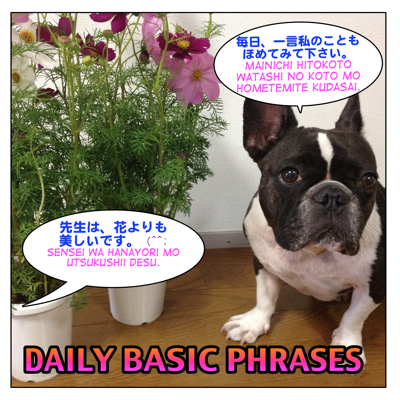 This lesson will help you understand how to use の. Can someone translate this for me, I believe it is just a like in Japanese social media but I don’t know. いいね(=iine) means to click “like” on Facebook. いいねした(=iineshita)/ (polite) いいねしました(=iine shimahsita) is a past tense of “to LIKE” (=clicked “LIKE” button) someone’s picture or message Facebook. 1) It’s a sound of drum or when things are moving rapidly or to describe some action keeps going. どんどん暗くなる= It is getting darker and darker. どんどん時間が過ぎる = The hours go quickly. Go check my 数字 lesson, OK? many conversation is added with "koto",how to use koto? verb てもいいですか？= asking for permission. Ex. Can I eat? = 食べてもいいですか？= たべてもいいですか？= Tabetemo ii desu ka? Ex.Can I come in? = 入ってもいいですか？= はいってもいいですか？= Haitte mo ii desu ka? Ex. よく寝(ね）た。= I slept well. Ex. よく笑(わら）った。= I laughed a lot. Ex. よくここに来(き）ますか？= Do you come here often? Ex. Do you like me? = 私のこと好き？= Watashi no koto suki? Ex.Can I try it on? = 試着してもいいですか? = しちゃくしてもいいですか？= Shichaku shite mo ii desu ka? why can’t this translate as:what languages did you speak?